Authors Andrée Tremoulet, Ellen Bassett, and Allison Moe tell a story about balancing public concerns about encountering the homeless in highway rest areas with the need to connect them with resources to address the complex social, political, and economic circumstances underlying their lack of housing. Initially appeared in the Summer 2014 Metroscape, published by the Institute of Portland Metropolitan Studies, Portland State University. Tremoulet, A., Bassett, E., and Moe, A. 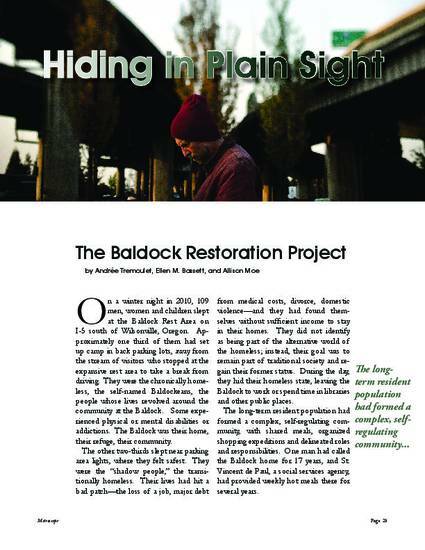 "Hiding in Plain Sight: The Baldock Restoration Project", Summer 2014. Metroscape, p. 25-30.